Tulips are originally from Turkey, the Dutch hybridized them. These bulbs are generally speaking fairly tough, well drained soil lots of sun, plant about 15 – 20 cm deep, depending on bulb size. If you dig the bulbs in late summer, and store them in a cool dry place after the foliage has died down they will last longer. A feature of the Australian Gardening calendar is Tesselaars Tulip Festival, well worth a visit. 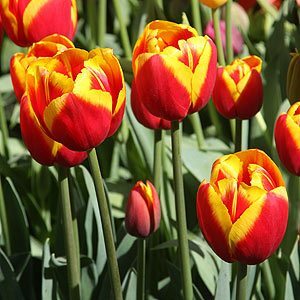 In the past it was thought that growing tulips in Australia was confined to the cooler areas, Tasmania and the Highlands and Foothills of Victoria, Southern New South Wales and South Australia. However many varieties will grow in much warmer climates, and some do not require the winter chill factor of others. Single Late Tulips and the Species are worth growing in warmer areas. 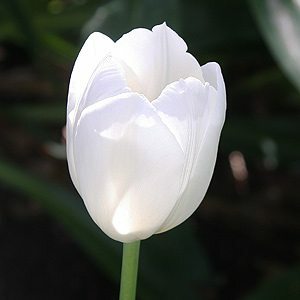 Tulips make excellent cut flowers ( a little sugar in the water will make blooms last longer). Chilling the bulbs for approx 7 weeks will ensure long flower stems, so buy them in March, place them in the refrigerator, not the freezer, and plant in May. A soil rich in humus is best for growing these bulbs, so dig in well rotted manure. Buy bulbs in autumn, they are usually planted in early Autumn, after the last hot days of summer. A well dug soil is best, tulips do well if refrigerated for 4-6 weeks before planting. This imitates a cold winter that they are used to in the natural environment.